For the next five years he led a vagrant life. Some of this time was spent at his parents’ home in Southwold, Suffolk. There were periods teaching in private schools, living in Paris and masquerading as a tramp, the background to his first published work, Down and Out in Paris and London (1933). His professional alias, which combined the name of the reigning monarch with a local river, was adopted shortly before publication. His teaching career was brought to a close by a bout of pneumonia and at the end of 1934, having used a long, recuperative stay in Southwold to complete a second novel, A Clergyman’s Daughter (1935), he decamped to London to work in a Hampstead bookshop. This was a productive period. 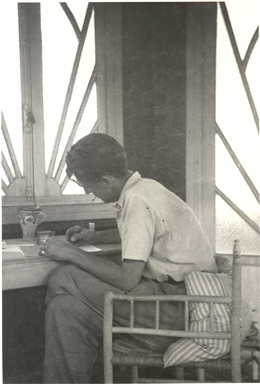 Here he met and married his first wife, Eileen O’Shaughnessy, and wrote a third novel, partly based on his book-trade experiences, Keep the Aspidistra Flying (1936). Great literature is,indeed,timeless…It is SOOOOOOOOO amazing how 1984 is our present world’s reality…Bravo,Orwell ,the Visionary !!! Having read about many people who have changed our world, one way or the other, a commonality among most of them have been the harrowing lives that they have lived. It seems that the human mind and spirit thrives most when digging oneself out of a grave. Orwell was no different. What a great mind. Reading the diaries and the biography by D.J. Taylor makes me want to read more by Orwell and know more about the man. Thank you for making me aware that he was more than an answer to a trivia quiz. “Animal farm” foi editado em Portugal c/ o título “O triunfo dos porcos” e foi um grande sucesso. His work is highly appreciated by readers all over the world. What I can say about ”1984” is that it is an incredible book, but it is definetely NOT our reality.It has some ideas that can be nitoced in some sociaties, but, fortunately it is not reality, it is only a ”terror” which should not to become our reality! Actually, 1984 is one of my favourite books!!! Great author and great man also. For those interested, I recommend the biography written by Bernard Crick. what about Orwell in spanish civil war? Why did he go there to fight or to witness the opportunity for common people to get a new era of self fulffilment as it can be understood from Coming up for Air? its very impressive biography that so l love it iam waithing again this type of biography. “Democracy is the worst form of Government except all those other forms that have been tried from time to time.” — Winston Churchill, 11 novembre 1947. George Orwell was maybe right in his “1984” essay, or novel was it ? Let us not believe democracy is a nirvana, it is but a lesser hell than other regimes, and has in common what power has in common, that is to use the system’s weakness wherever it be, and democracy remains weak when it assumes lies as truth, institutions as a guarantee of freedom. Like Orwell, let us see facts and fight blindness in the face of emphasis. A great author, and many thanks to this Orwelldiaries. Some of my earliest memories are of sitting talking with my grandfather, who, regardless of the fact he was a life long Conservative voter, admired and often quoted Orwell to me as I was growing, and indeed, both my grandparents urged me with dire warnings that the price of freedom is vigilance and that we would live in a total surveillance society. Much of the wisdom that my grandparents and Orwell’s generation possessed is being lost to the populous, even though many of those dire warnings appear to becoming actualities. Thank you for helping bringing back such precious memories. Right! Were did I put that copy of ‘Shooting an Elephant’? While I’ve read many books about animal husbandry it has me confused how this bloke has confused politics for procreation. That is, in the real world a fair amount of asses do sit on the fence as a way of avoiding responsibility. After all, an elephant sitting on a fence would appear somewhat inelegant, you’d agree? To continue. This reliance on animalistic transsubstantiation, as it were, does none of us much good. Mr Eric Arthur Blair’s (Arthur is such a cosy sounding name) early experience in a police force should have educated him. Some professing humanity do act as pigs. Some of certain religious persuasions are averse to pigs. Then in other parts of the world; piggery and thuggery go hand in hand. I live in Queensland Australia and know this for a fact. So while ‘George Orwell’ did his best to educate us about how not to behave – in actual fact his prime effort has been used as a textbook example of how to cause more grief to infinitely more people throughout every society on the face of this planet. Just bend corporate psychopathy at an early age towards an industrial process. Isolate the majority for long enough until they become inured. I’m reasonably convinced that accidents did happen. This Eric Blair was undoubtedly a creature of Empire. His own works disclosed that. The events of his age betrayed that. As Empire untwined – so did the beliefs of those involved. Those betrayed; disenfranchised by the collapse of profound belief tended to look for other causes, invented, then invested in other causes; or when all else failed, wanted to make allegorical statements about what went wrong, then eulogise for the rest of their natural about the result of the world falling apart about their ears. Let’s not mention the Mitfords. Given the attitudes of the plutocracy then, the outcome would not have been too difficult to predict. The sometime winners of raffles – professional gamblers – I do mean those who temporarily win office by election, want to claim too much power after winning their game of chance. If in office long enough, the hint of scandal might make for a few extra books sold, or at least a year or two more on the toastmaster’s circuit. It has all made an industry of what was once the family business of the select few. Back in Eric Blair’s day it was more of a family business condoned by entrenched and unelected power. The secrets were held close and only shared with trusted friends. Now that another Blair’s efforts have turned to dust it reaches the stage where a person wonders which pathway contained the greater virtue. I was intending to say, stupidly, that, at least, the old sort tended only to stuff about their own kind. Then, fortunately or unfortunately, I remembered the Somme, Passchendaele, Arnhem, and Coventry, Liverpool, Dresden and Hamburg, Caenne – and worse as the years roll on – the harvesting and liquidation of innocents, or those unfortunate enough just to be there. I am deeply indebted to Orwell for his insights into the violent and authoritarian nature of modern nation states (democratic or not). Yes, he is one of our great visionaries. George Orwell’s cynical realism has inspired me all my life! Totalitarian communism may not have been an answer. But how much better is democratic capitalism? You are certainly a non writer. Are you also drunk? Ciò che vorrei sottolineare è la coerenza nelle scelte di vita che ha sempre caratterizzato la vita di George Orwell : un esempio per tutti noi, un uomo che non si è mai venduto.